Nigel Slater's recipes are often seductive in their simplicity. 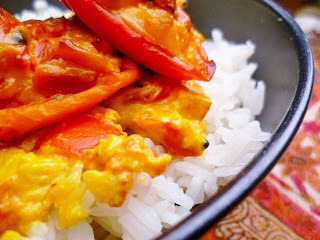 The Kitchen Diaries II recipe simply entitled tomatoes, spices, coconut is the perfect case in point. Although I have to confess to being a teensy bit perplexed by his addendum ("shouldn't work but it does"). Why shouldn't it work? Is it because Nigel has stuffed tomatoes with well, yet more tomatoes? It can't be because of a gorgeous combination of onions, garlic, fresh ginger, mustard seeds, peppers, cherry and vine tomatoes, red chilli, turmeric and coconut milk? Can it? No, of course not! 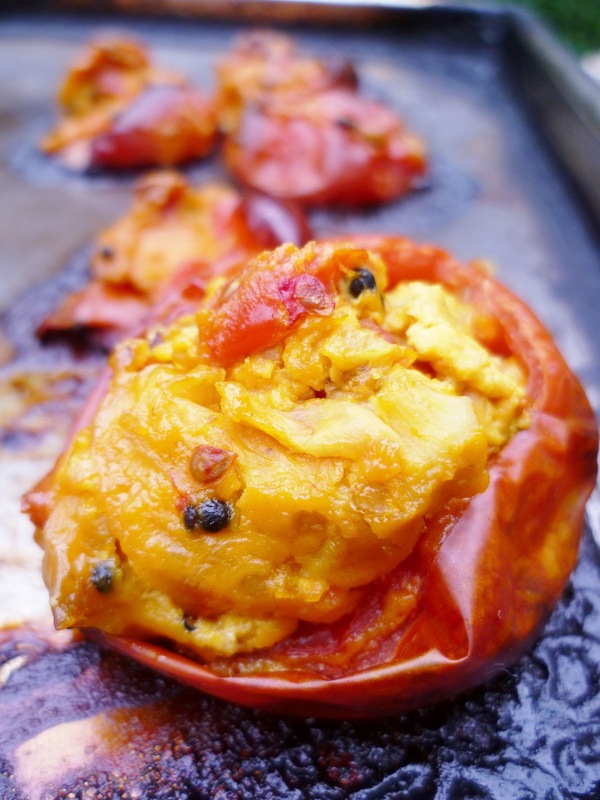 I wanted something comforting, vegetarian (as I am not eating much meat at the moment) and easy. While this took about 50 minutes to make, most of that was the time spent for the tomatoes to bake in the oven. Then I served the dish with plain steamed jasmine rice - which sounds a bit hair-shirt. But it was a gentle, soothing sort of supper; the perfect restorative! 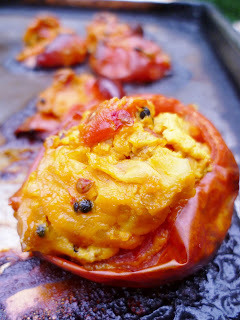 While I had these stuffed veggies for supper, I think they would be fabulous as a starter or as a side dish. They were even rather nice at room temperature, so make more than you need and take them to work as a part of a packed lunch. So if you haven't had a look at Kitchen Diaries II, then this recipe on page 390 is worth a try. 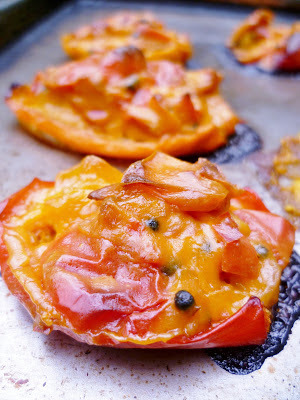 The recipe is actually in the October section of the book, using the last-gasp-of-summer tomatoes, but I have a glut of them right now and I just couldn't wait until the autumn to try this recipe! Frankly, the photograph in Kitchen Diaries II by Jonathan Lovekin is perfectly mesmerising and the end results are creamy, fragrant and utterly delicious. I had to make a few very minor changes. I used coconut milk rather than creamed coconut Nigel suggested, since I had a tin on hand. I just used as much as I needed to get the right consistency. Besides Nigel isn't prescriptive about these things. I wasn't clear on the type of mustard seeds to use - the recipe just called for mustard seeds. Should that be mellow yellow mustard seeds or perkier black mustard seeds? Needless to say, I compromised and used a half teaspoon of each. It eeemed to work. Finally, as well as stuffing tomatoes, I also stuffed some baby red, yellow and orange sweet peppers, which I hesitate to suggest, might have been even more gorgeous than the baked tomatoes! 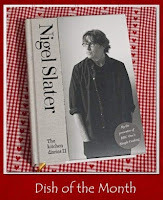 Since this is a Nigel Slater recipe, I am entering into Janice at Farmersgirl Kitchen Nigel Slater Dish of the Month challenge, jointly hosted in July by Sue at A Little Bit of Heaven on a Plate. Janice and Sue are challenging you to cook a Nigel Slater recipe every month and of course, I am only too delighted to take up their challenge. But do check out the challenge, since all the recipes are absolutely gorgeous. Naturally. 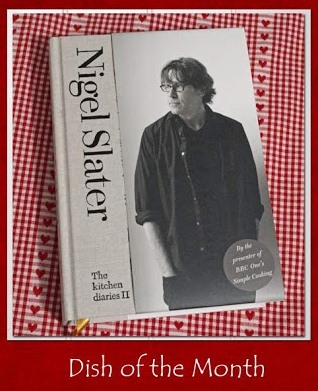 They're Nigel Slater's! This sounds delicious! I've got the book but no oven at present "sigh"! Have you ever met Nigel? Glorious dish, what's not to like? Thanks for joining us for Dish of the month, Rachel. I haven't met Nigel although I did once see him in a fishmongers in Islington. But I was too shy to say anything! Besides the poor chap was buying fish and probably didn't need my all starstruck and gushing! My pleasure as ever Janice. Looking forward to seeing what you come up with this month - your nettle tart was a triumph! this looks gorgeous, and really interesting to add coconut! I eat meat but less now and especially when it is so hot!